Mullen was far from first choice, he was not the idea of what the fans wanted as the next manager having worked alongside Casper for over a year. They wanted a new broom sweeping through. However, most of the leading candidates had Burnley connections. Firstly there was Brian Flynn who'd been in charge of Wrexham for almost two years. He was preparing this team to face Burnley but there were strong suggestions that it could be his last game with the Welsh club before a return to Turf Moor. Then there were other former Clarets including Leighton James, Dave Smith who had left Torquay just over five months previously, and Chris Nicholl who had just departed Southampton. 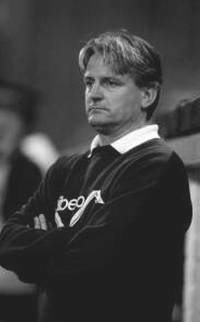 Others were Don Mackay, on the look out for a new job having been forced out of Blackburn, and Wigan's manager and chief executive Bryan Hamilton. Stan Ternent, who had lost his job at Hull in January, was also in the reckoning but all these names seemed to be blown out of the water when Bristol Rovers suddenly announced they had parted company with Martin Dobson by mutual consent. Burnley fans had wanted Dobson to return ever since he left Turf Moor in March 1984 to become Bury player/manager. There was no indication from the club as to who might get the job but chairman Frank Teasdale was very quick to distance himself from any move for Dobson. Meanwhile, Jimmy Mullen was to continue as caretaker against Wrexham, to pit his wits potentially against our manager elect in Flynn. On the day that Casper left, Teasdale said the matter would be dealt with swiftly. He said he did not want speculation spreading as wildly as it had at Blackburn since Mackay departed. Meanwhile Mullen confirmed that he'd definitely accept the job if it were offered and admitted to being frustrated as the speculation continued with no apparent positive action taken by the board. He was left to continue on a caretaker basis for now and said: "We are hoping to carry on where we left off last weekend and will be looking for another win at Wrexham. The spirit in the team has been very good and the players know what is expected of them." It looked certain there would now be no appointment ahead of the Wrexham game and there was no doubt that a win on the road would strongly boost Mullen's hopes of becoming Burnley's next manager.